Travel is ALWAYS a good idea. Especially during the holiday season! Whether it’s quick jaunt to visit family, or a hop on a plane across the world, the holiday season seems to invoke the travel bug in all of us. I’m sure you know a jetsetter or two in your life, and they’ve probably got their essentials covered. But even the most avid traveler still needs a new thing or two for their next trip. 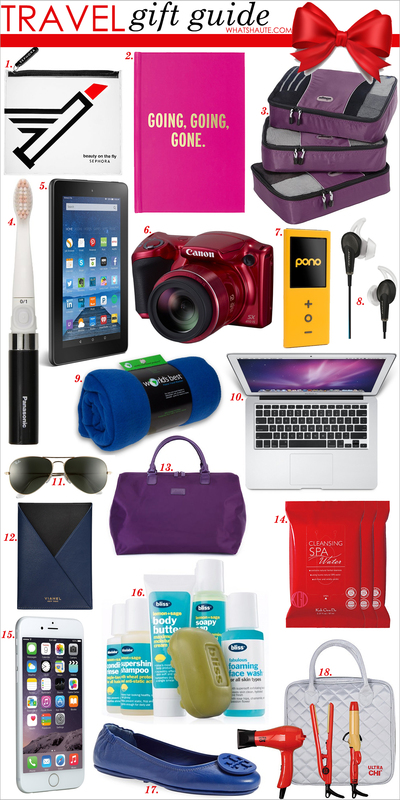 Shop this collection of gifts for every travel addict you know! 1. SEPHORA COLLECTION Beauty on the Fly / $4.95 – Ditch those Ziploc bags and store your beauty essentials in this chic pouch instead! 2. kate spade new york travel journal / $18 – Take note of your travels in this pretty, pink notebook. 3. eBags Medium Packing Cubes – 3pc Set / $18.74 – These make packing so much easier. 5. Kindle Fire HD 8, 8″ HD Display, Wi-Fi, 8 GB, Black / $144.99 – Tote all those good reads in one convenient place. 6. Canon PowerShot SX410 IS (Red) / $179 – A picture is worth a thousand words, and you’ll get the best memories with this compact Canon. 12. VIANEL New York V12 Passport Cover / $160 – Keep your passport in stylish shape by tucking it into this sleek leather case. 13. LIPAULT PARIS Weekend Carry-On Satchel / $79.20 – This chic carry-on is both lightweight and stylish. 14. KOH GEN DO Cleansing Spa Water Cloths / $39 – These are great for keeping your skin refreshed while on-the-go. 15. Apple iPhone 6, Silver, 16 GB (Unlocked) / $629 and up – My favorite travel companion – perfect for everything from maps, translations, photos, internet and email access and more. 16. Bliss Lemon + Sage Sinkside Six Pack Travel Set / $28 – The most luxurious body and bath treats, in a perfect travel size! 17. Tory Burch ‘Minnie’ Travel Ballet Flat with Logo / $225 – These stylish, foldable flats pack a huge color punch – and don’t take up much space in your suitcase.